Union Mattole, Squaw Creek, New Jerusalem… all designations of the mid-lower Mattole area favored by perfectly warm weather and clear skies all summer, lacking the harder frosts and snow of winters further inland as well as the cooler ocean effects, and occasional fog, of the mild Petrolia summers. In short, an agricultural paradise. Photo taken in Eureka, found in the Mary Rackliff Etter collection. Click on this and other photos here to enlarge. 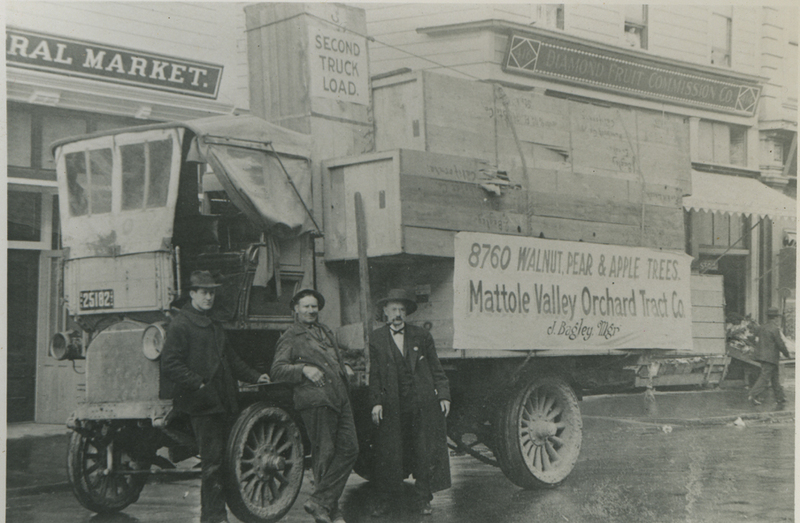 The picture above, of a truck carrying fruit trees to the Joseph Bagley orchard, seemed a good starting point for an introductory exploration of the apple business in this area of the 1910s and ’20s. Bagley’s original orchard covered land presently owned by the Yonts and the Burroughs families. Luckily, the MVHS has a wonderful document compiled by Susie Van Kirk, a Humboldt-area historic resources consultant, called “MATTOLE RIVER: Newspaper references from the Mattole River Watershed.” I called Ms. Van Kirk some time back and asked if i might quote from her collection and she generously said “Of course,” since the text is all from local newspapers anyway; but she sure saved me a bunch of work! So, a big “Thank you” to Susie Van Kirk. The Nov. 1 Enterprise of that year goes on about the “… good and substantial promise of the building of a wharf and the construction of a railroad by Messrs. Stewart and Johnson of Bear Harbor, in order to ship from this valley and the surrounding hills the vast quantities of tanbark found thereon which has been growing there many years to swell that particular industry…. No one can regard this matter as idle gossip, for the promoters of this enterprise mean business and are men of their word. It is one of the greatest opportunities this community can ever expect, so it stands every property owner in hand to boost the proposition and help it on with their shoulders to the wheel for its earliest construction and completion. For what does it mean to all? Why, it means a cheaper and more rapid way of marketing your beef, orchard and farm produce and thus increase their production and make such industries profitable ones. It will bring ten people here where there is only one now, and all this means more work, more money in circulation, cheaper living than that of today…. and you should not forget that it will give the oil companies a chance to bring their operating machinery here and land it almost upon the fields of proposed operation, and what better prospects of prosperity could anyone ask than the creating of such an industry as oil mining…” Well! Probably oil would have been more profitable than apples. But you can eat the apples! “W.E. Roscoe has received an order for 4000 trees, apple, pear, and walnut, to be grafted this spring. 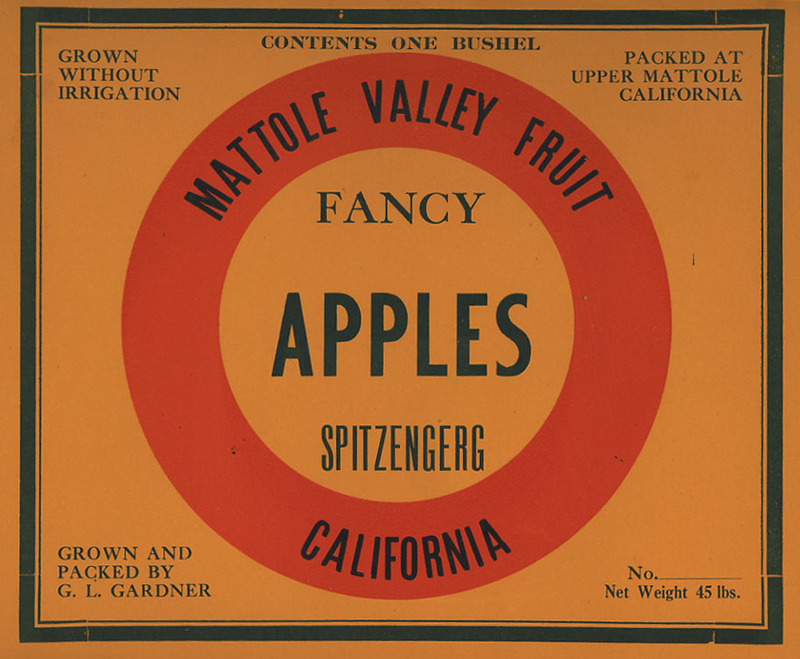 Mr. Bagley will specialize on the Jonathan apple, which he believes to be best adapted to the Mattole valley, an opinion that is shared by some Mattole orchardists…” was the news of Jan. 6, 1914. And next, on Feb. 13, 1914, comes the information for the picture above (though i didn’t realize this until i typed it! ): “Ten Thousand Trees for Mattole Ranch–Last Tuesday and Wednesday there arrived in Ferndale by auto truck from Eureka 8760 walnut, almond, peach, apple, pear, cherry, and plum trees, as well as a large variety of grape vines for the Mattole Orchard Company of Upper Mattole. Later other shipments will follow, bringing the total number up to more than ten thousand. Four, four-horse teams were required to take the trees from Ferndale to Mattole, two of which left yesterday and the others will go today. 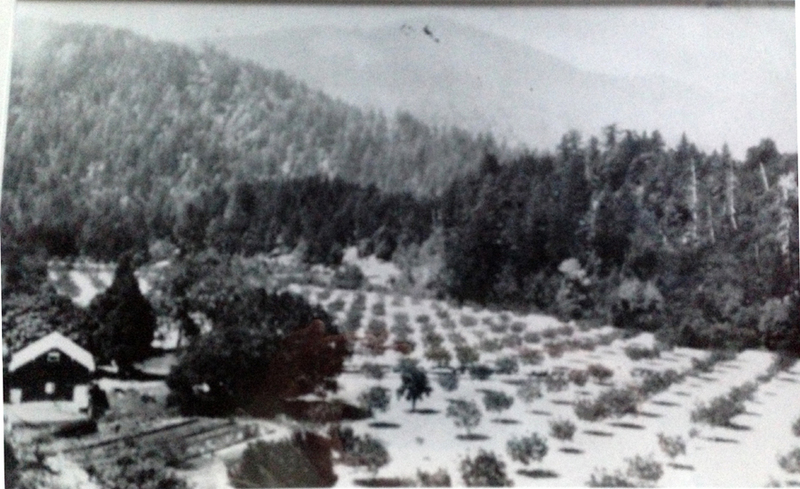 The old Bagley orchard, looking southwest toward Cooskie Mtn. Thanks to Linda Yonts for sharing this photograph. Elphic appears in Ken Roscoe’s book as Jim Elphick of Sebastopol. Ken assigns him the responsibility of having carried in coddling moths on apple sacks he brought up from the south, unwittingly no doubt. They spread all over the Valley and necessitated the spraying of arsenate of lead, which may have negatively impacted the health of the soil from that point on. However, he says the Mattole continued to produce good apples, and that a problem more pressing than the moths now would be the modern apple maggot. I’ve noticed that bears can take quite a liking to apples, too! Albert Etter was in Ettersburg at this time, but his attention didn’t turn to apples, with spectacular results, until the late twenties. For many people, his name comes up immediately when one mentions Mattole apples–particularly his popular Pink Pearl and Waltana varieties. There are a couple of issues of our MVHS newsletter, Now… and Then, with stories on Etter and his fruit, one by Ram Fishman and one by yours truly. An earlier passionate apple-growing family was the Gardners of the Union Mattole neighborhood. 1921 Belcher’s map section. 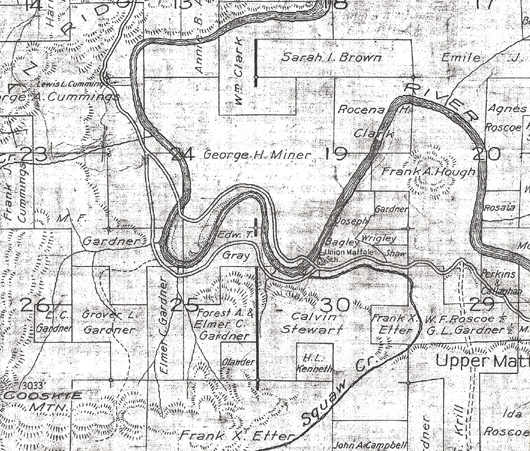 Note Bagley’s orchard property to the east of the right-hand stroke of the “W” in the river. Gardners are all around, and Dr. Perkins’ place is on the far right of the map, which also begins Roscoe country. Note that there will be an Apple Festival at the Mattole Valley Community Center this Sunday, October 20, 2013, from 11 ’til 4. All are welcome… let me know if you want more information. But don’t let it stop you from coming down to the Mattole Valley Historical Society meeting at the Mattole Grange just after the Pancake Breakfast the same day… from noon until 2 at the latest, we will discuss the Mattole estuary and beach with old-timer Erwin Frederickson and BLM employee Gina Jorgensen. Hope to see many of you there… and off to the apple celebration afterward!